↑ Hicklin, Aaron (11 February 2013). "The Long Education of Daniel Radcliffe". Out.com. Retrieved 13 February 2013. ↑ ""Harry Potter's" Daniel Radcliffe stars in Martin McDonagh's play "The Cripple of Inishmaan"". IrishCentral.com. Retrieved 10 November 2015. ↑ "Top of the form". The Jewish Chronicle. 20 December 1968. p. 26. ↑ McLean, Craig (15 July 2007). "Hobnobs & broomsticks". Sunday Herald. Herald & Times Group. Archived from the original on 18 July 2007. Retrieved 15 July 2007. ↑ Koltnow, Barry (8 July 2007). "One Enchanted Night at Theater, Radcliffe Became Harry Potter". East Valley Tribune. Archived from the original on 11 October 2007. Retrieved 15 July 2007. ↑ Daly, Steve (11 July 2007). "Mr. Wizard". Entertainment Weekly. p. 2. Retrieved 28 May 2011. ↑ "Daniel Radcliffe". The-Numbers.com. Nash Information Services, LLC. Retrieved 28 May 2011. ↑ Daly, Steve (27 July 2007). "Daniel Radcliffe Talks 'Deathly Hallows'". Entertainment Weekly. Retrieved 28 May 2011. ↑ Itzkoff, David (15 April 2010). "Daniel Radcliffe to Star in 'How to Succeed' Revival on Broadway". The New York Times. Retrieved 27 May 2011. ↑ "2011 Outer Critics Circle Nominations Announced! SISTER ACT LEADS WITH 9!". BroadwayWorld.com. 26 April 2011. Retrieved 21 September 2011. ↑ Gans, Andrew (20 May 2011). "Mormon, War Horse, Normal Heart, Anything Goes, Mark Rylance Win Drama League Awards". Playbill. Playbill, Inc. Archived from the original on 14 September 2011. Retrieved 21 September 2011. ↑ "56th ANNUAL DRAMA DESK AWARDS ANNOUNCED AT NY FRIARS CLUB BY AUDRA McDONALD AND LIEV SCHREIBER". Drama Desk. Archived from the original on 3 July 2011. Retrieved 31 May 2011. ↑ McLean, Craig (4 July 2009). "Dan the Man". The Guardian. London. Retrieved 11 July 2009. ↑ Sessums, Kevin (26 January 2009). "Dirty Harry". The Daily Beast. The Daily Beast Company. Archived from the original on 10 January 2018. Retrieved 10 January 2018. ↑ Duke, Barry (6 July 2009). "Shock, horror! 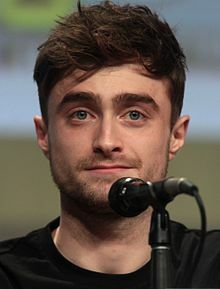 Harry Potter star Daniel Radcliffe is an atheist". The Big Issue. Retrieved 15 July 2017. ↑ Singh, Anita (4 June 2009). "Daniel Radcliffe: a cool nerd". The Daily Telegraph. London: The Independent. Retrieved 6 June 2009.